The taste can easily be enhanced with Verival Bio ingredients. 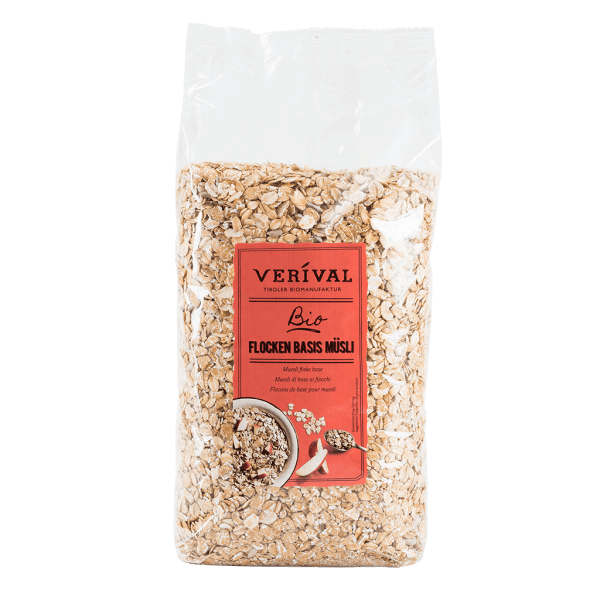 A flake mixture with sunflower seeds, sesame and brown linseed; no added sugar. Using this basic assortment, there are no limits on your imagination for putting together your own ideal muesli. Complement the assortment with fresh fruits, milk products, yoghurt or fruit juice, just as you fancy. Wheat flakes* 50%, oat flakes* 15%, barley flakes* 15 %, spelt flakes* (wheat) 10%, sesame seeds*, sunflower seeds*, linseed*. > May contain traces sesame seeds, lupines, soy and other nuts.